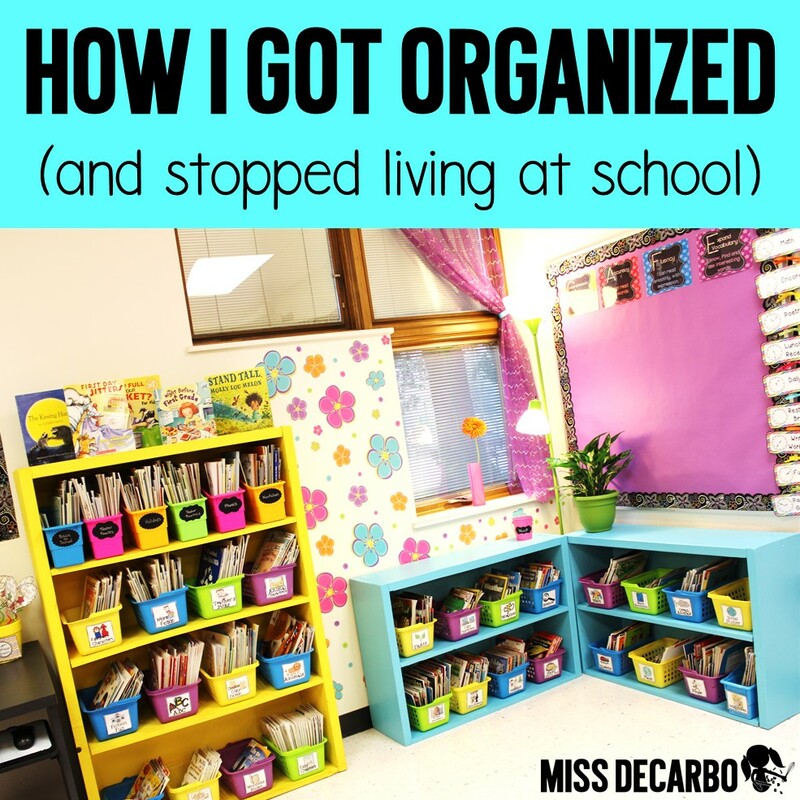 In this post, I’m going to tackle two questions I get asked all the time: “How do you stay so organized throughout the week?” “Do you do all of your lesson planning at home?” I’m going to share my organizational tips and tricks with you, as well as my personal weekly routine I use throughout the school week. Truth: I used to spend hours and hours lesson planning at home every night. Finally, I told myself, “No more!” I knew in the near future I wanted to start a family and that the hours and hours I was spending each week on plans would not be possible – or healthy – for a balanced life. So, I devised an organizational “system” that worked for me. *Reading passages we will be using for our small groups. On Tuesdays, I also pull any content related activities I want to use for next week. I’ve spent a lot of time organizing my materials over the past few years and it has REALLY paid off. One thing I’ve loved doing is transferring my printable and copies to a binder system instead of filing cabinets. It just makes more sense for me to grab a binder filled with resources instead of sifting through a pile of random papers that are spilling out of file folders. 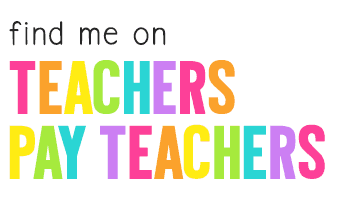 I am a teacher who loves to be a “resource leader” in my school. For example, if a teacher friend is looking for science ideas, it’s easier for me to grab my Science Binder and have all of my science units organized for her. Of course, once again, you need to figure out a plan and a system for filing your papers that works for you. Binders work for me. Binders did not work for my sweet friend Kristin, who recently shared a hilarious post about her love for file folders that you can read here. Remember, whatever makes your life easier will help you stay organized. In the picture below, you can see how I have organized all of my materials into monthly thematic binders and binders by subject. If I have little centers or task cards to store, I store them in a sheet protector within the binder. This keeps everything nice and tidy. The ADORABLE binder covers in the picture above are from my sweet friend Haley O’Connor. You can find them in her TpT store by clicking HERE. WEDNESDAY & THURSDAY: FILL IT IN! Now that everything I need for next week is copied and pulled, lesson planning is much easier on Wednesdays and Thursdays! I simply plug all of the activities we are doing into my lesson planning template. I type out my main subjects on Wednesday and I plan my small reading groups on Thursdays. By Thursday after school, my lesson plans are done! Finally, I print them off and save them into our district Dropbox. 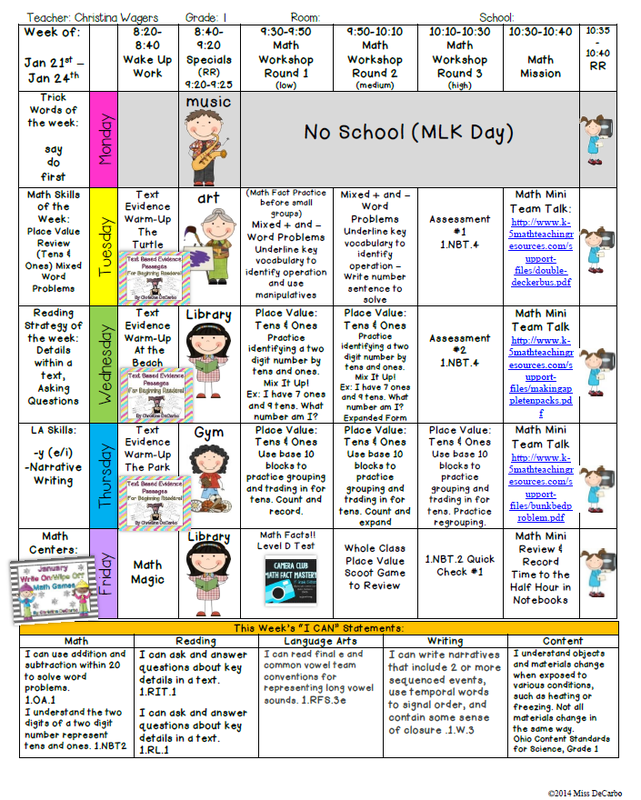 You can download a weekly sample of my lesson plans below. I am blessed in that my district does not require us to write super, super detailed plans. We are expected to list the standards we are focusing on each week and have an instructional plan in place by Monday mornings. You can download the plans below to get clickable links for the resources I used by clicking HERE. You must download in order for the links to work. Many people have asked me if I have an editable version of the lesson planning template I use available. 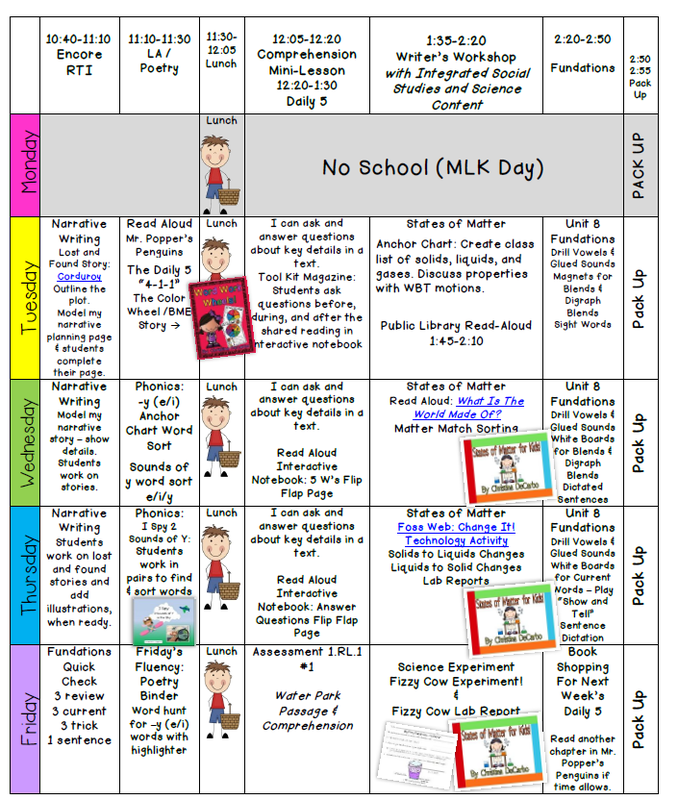 You can find templates such as mine from A Teacher’s Plan by clicking here. Friday’s are saved for “putting everything where it goes.” I also write my classroom newsletter on Fridays so that it is ready to send home on Monday. The piece of furniture in the photograph above is literally falling apart. If you bump into it, it may crumble to the floor. (It must be well over 15 years old!) It’s also my FAVORITE item in my room. No, it’s not pretty, but it keeps me super-organized! It’s a large table-like paper sorter that sits against the wall behind my desk. When it breaks, I am going to cry. My organizer has six rows to it and I’ve assigned each row a day of the week. On Fridays, I plan out my papers that I’ve copied for each day across the coordinating row. In the first column, I place my morning work. 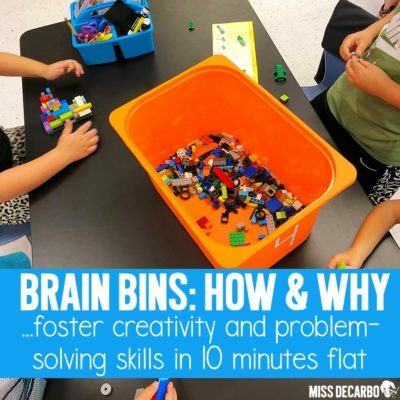 The second column contains math printables. The third column is reserved for our whole group reading activities, and so on. ALL of my activities and papers for the week are placed in this paper sorter, making it super easy for me to know what’s next and where things are! It also makes it easy for a sub to find what he or she needs if I was ever out for an emergency. WHAT ELSE SAVES ME TIME AT SCHOOL? I refuse to spend any of my personal time prepping the classroom for little things like moving lunch choices back and behavior clips back. Why? Because this is not actually MY classroom. The classroom belongs to my students. My kids all have a job to do at the end of the day, and they love it! 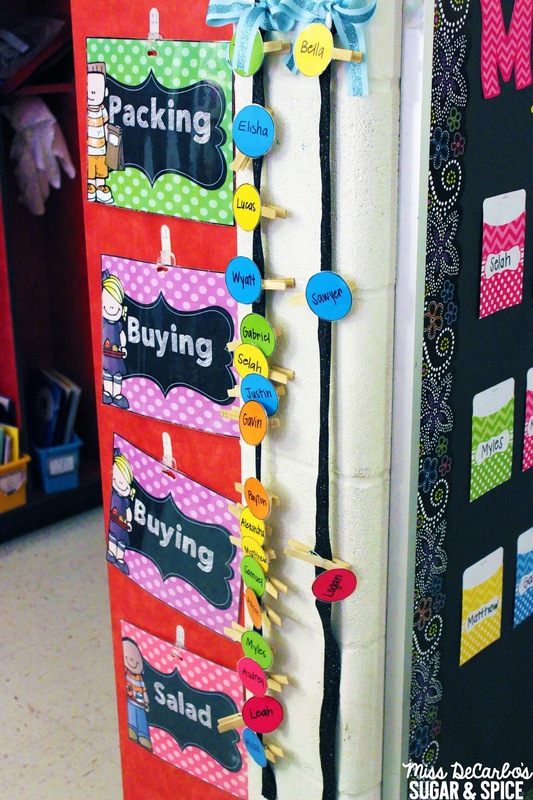 They move the clips back on our behavior chart at the end of the day. They put the lunch choices back so they are ready to go for the following day. You can grab these lunch choice signs for free by clicking here. I even teach my first graders how to turn off the Smart Board at the end of the day and how to turn off my projector on my desk. Kids NEED responsibility in the classroom – this is what makes a classroom transform from “my classroom” to OUR classroom. It also frees up precious time for YOU to enjoy your evenings and weekends! 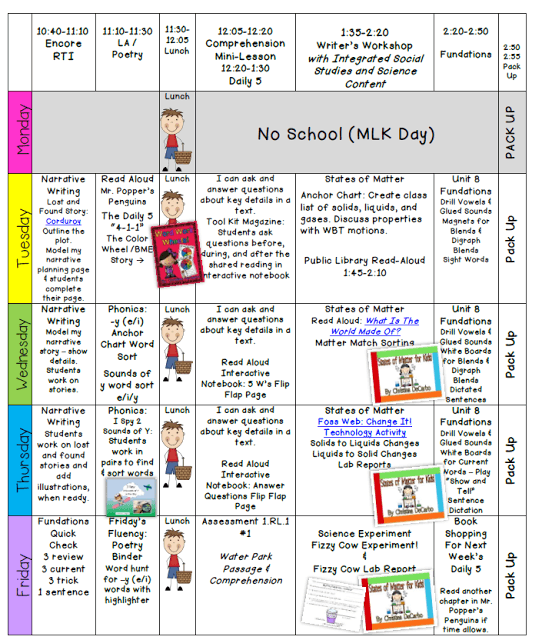 I hope you found my weekly schedule and routine for lesson planning and preparation helpful! I no longer spend hours of personal time at home on lesson planning and prep work. Don’t get me wrong, I definitely do spend some of my time at home on school stuff. However, that time is now spent on interventions for my kids and differentiating my new activities to better meet my kids’ needs. Having a designated routine for the week has made me a much, much happier and less stressed teacher. I find that I’ve learned to appreciate my classroom and my time at school more, because I am not constantly thinking about it and stressing out over it 24/7. I know that making my family a priority ultimately benefits my students, too. Instead of getting a teacher who is burnt out by November, they have a teacher who is eager to see their smiling faces every morning! 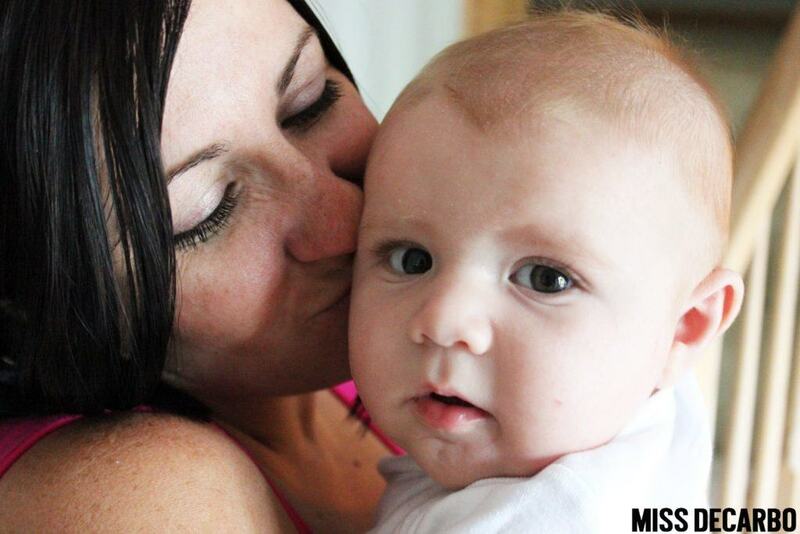 Being a happier and healthier wife and mom, means that I am a happier and healthier teacher for my sweet students. Thank you for visiting my blog today! Please feel free to use the image below and save it to your Pinterest board to refer back to. Or, share it with your friends by using the purple social media tabs at the top of this post. LOVE LOVE LOVE your Organization! I think I am going to move my week around to get my copying done earlier too! That makes a TON of sense! I “have” that time when my kids are at specials but it’s constantly interrupted with meetings, other teachers, etc. Great organization Christina-love the binder idea. Thanks for sharing! Amazing post Christina! I pinned some images to my Pinterest boards. 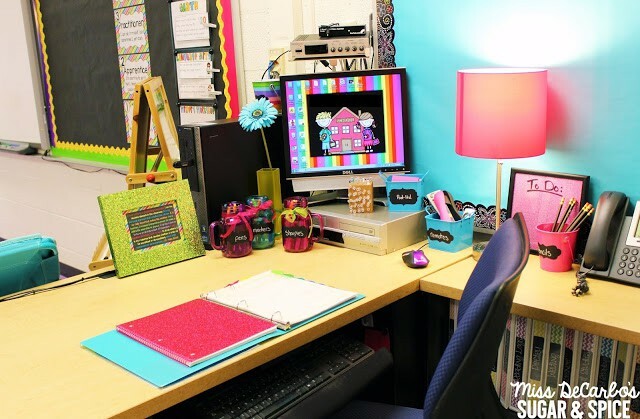 Your room is adorable and that desk of yours is. so. clean. and. organized! Thank you thank you thank you!!!! Just what I needed to get on my organizations game!! 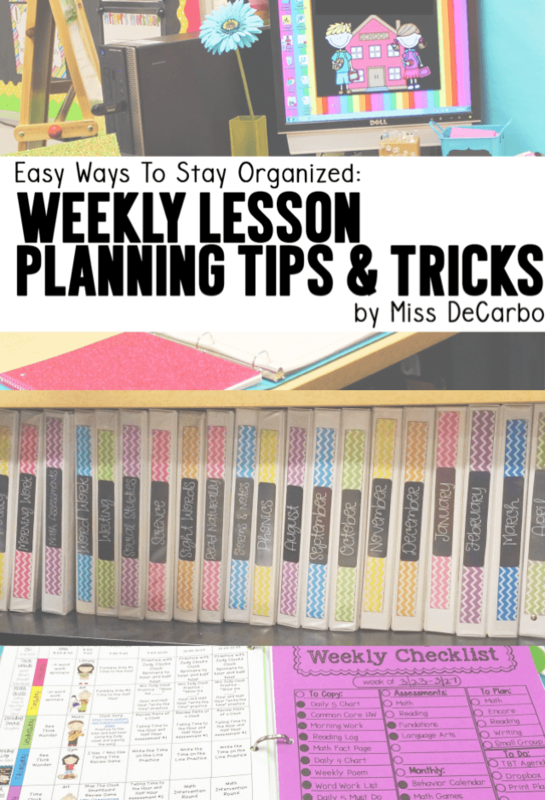 I'm currently ahead on my lesson plans so it is the perfect time to implement your tips and tricks! Love these tips! One thing that has worked out for me this year is that our lesson plans for the next week are due on Thursdays not Mondays like last year, but I am still doing a ton of stuff on the weekend. I am going to give your tips a try! Thanks for sharing! Another amazing post! I loved reading this! I could pin every picture but I stopped myself at 3… or 4. Thanks for sharing these great tips! LOVE.IT.ALL. Pinned and so prepared to change how I do my planning. Thank you for pointing out that our personal time should be OUR personal time, not doing little things for our classroom! Very excited to start implementing some changes to my planning routines. Awesome, relevant post, Christina! Thank you for all of this valuable information! Organization is my pet peeve and I am trying really hard to get better at it! Love the binders and the check list! Thanks again for sharing! Wish me luck! Christina you are adorable and amazing!! I am interested in the numbers on your floor… What are they for and where did you get them? This is a great time of year to reflect on ways to improve with this group. I definitely need to update the day I copy/type plans. 🙂 Thanks for sharing! 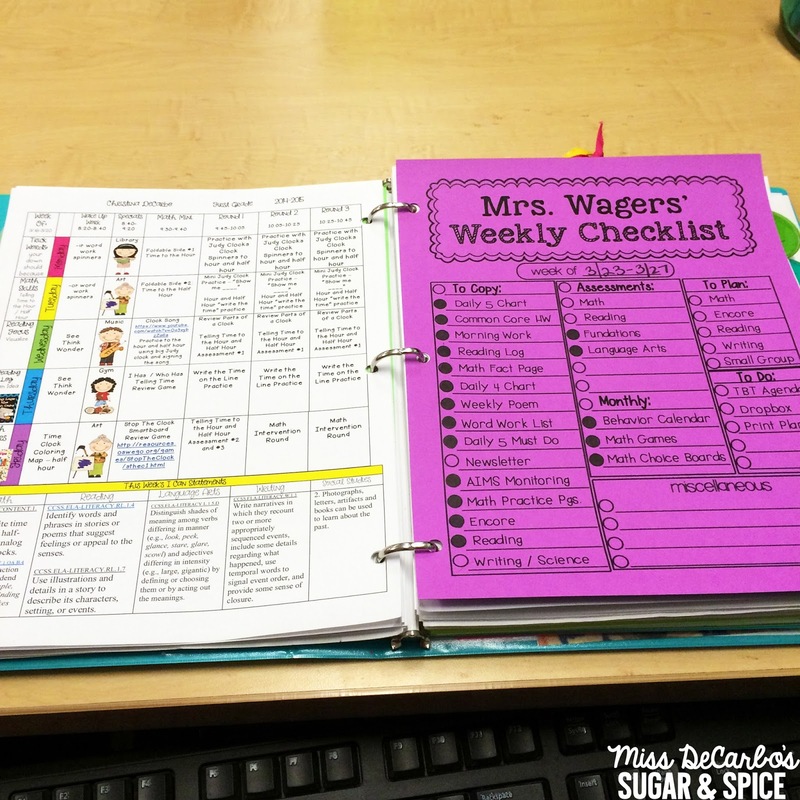 I LOVE the idea for creating a checklist that you can just print off! 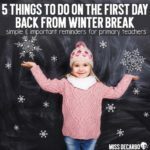 It's so true that there are some things we do EVERY week so it would be awesome to have a pre-made checklist that I can add to. I hate being "that" teacher who has to get an e-mail or phone call reminding me to do something that slipped my mind. 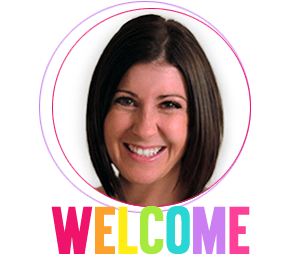 I am a huge planner, and I can tell you are too! I plan almost the opposite of you. 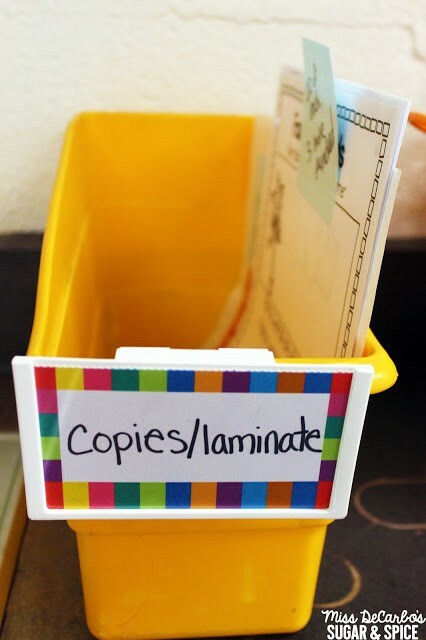 On Monday I write my plans, Tuesday I copy, Wednesday and Thursday I create resources (cards for tubs or charts), and Friday I organize all of the materials for the new week. I almost never take work home. Lauren: I used to have my files organized by week until our district changed the curriculum calendar. They moved academic topics from fall to spring, winter to summer and viceversa. You are amazing!!!! Great post! I think I change things up too often in my classroom to get into a good routine for organization like you have. I really need to fine tune this and now I am inspired to do just that. Thanks for sharing your ideas! Loved your ideas! I learned early on in my career to plan ahead. We had a central copy center with a 2-3 day turnaround. It was so much easier to have my plans done for the following week early so I could have black and white copies rather than the "ditto" machine. Thanks for the reminders and the picture of your "clean" desk! What program did you create your lesson plans in? I love it! Great post. Totally agree about the morning work. They can learn some responsibility and pick up what they need in the morning. I love all your organization ideas! I especially love your weekly lesson plan format. It's just what I've been looking for! Is it available for purchase as an editable document? Thanks! Love your organization and ideas. I always struggle with organization. Will try several of your ideas next week. Thank you for the ideas and the motivation to get started. 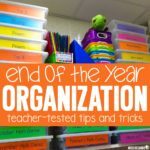 I love your organization tips! I am in my first year of teaching and trying to find a method that works for me! Can I ask how you organize inside these binders? Do you hole punch everything or are all the papers in page protectors? Would love to see a picture 🙂 Thanks! This is what I am most curious about right now too!!! I am very curious as to how you organize inside the binders as well. I really hate my file cabinet system. I pull too many papers out at once and then have to spend hours putting them back into the correct file! This would be so much easier! Like Keem I am interested in how the binders are organized. Do you use page protectors? Do you punch holes in originals? Would love to see some pics of the inside if possible….i'm a very visual person! I would like to learn more about your binder system as well. How do you store the masters? Clear plastic sleeves? Just hole punch them in? 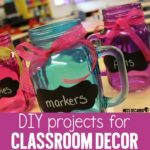 What about crafts that you do? How do you store things that you might have ran but didn't get to and will save it for next year?? Thanks! I would LOVE a copy of your lesson plans. Do you have an editable version? I want my plans to be as "pretty" as yours!! Hey there, I spent all night looking for the template just like your lesson plans on that blog. I can’t find it! Do you recall the name of it? Thanks!!!! Hi Kristen, This post was written several years ago, so I am unsure of whether or not she still sells this on her blog. So sorry about that! I really like your post and am your newest follower! I was wondering the name of your lesson plans/who created them? Or of you could post a link to the plans you bought. I've been looking on tpt for the same plans you use and havent been able to find them. 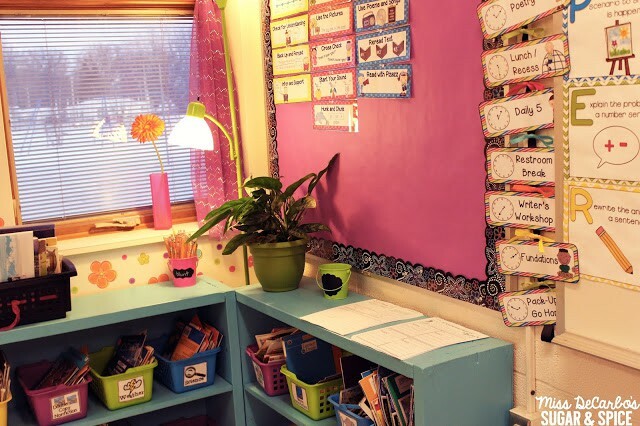 I like the layout, colors, and separate plan for reading groups. Thanks for your help! I'm student teaching soon. This looks very organized and awesome. But I'm definitely overwhelmed. Hopefully I'll be able to do something like this. Yikes. U r really awesome. Your kids are lucky to have you. What a great post! I love to read and see how other teachers organize their time and resources! I learn new things everyday that I can implement in my classroom. What a great blog post! I am a PE teacher, but could still see how to incorporate these ideas into my gym. Your students are lucky to have such an organized and creative teacher. THANKS!! I loved this so much! I'm still working on my degree and I'm anticipating getting into the classroom! Thank you so much for sharing! I hope I am able to be as organized as this. And I must say, your classroom is just the right amount of decorated. I've seen way to many over-done, or college dorm room looking like rooms. Way to busy. Yours is right on the money. Can't wait to learn more! I came across this post through Pinterest and I am so glad I did! 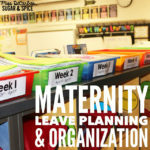 Organization has been a huge struggle for me, but this system makes sense and will work well with my planning schedule. Thank you so much for sharing! I have to say that this has really helped me plan lesson this year. I just loved having so much free time on the weekends not spent lesson planning. 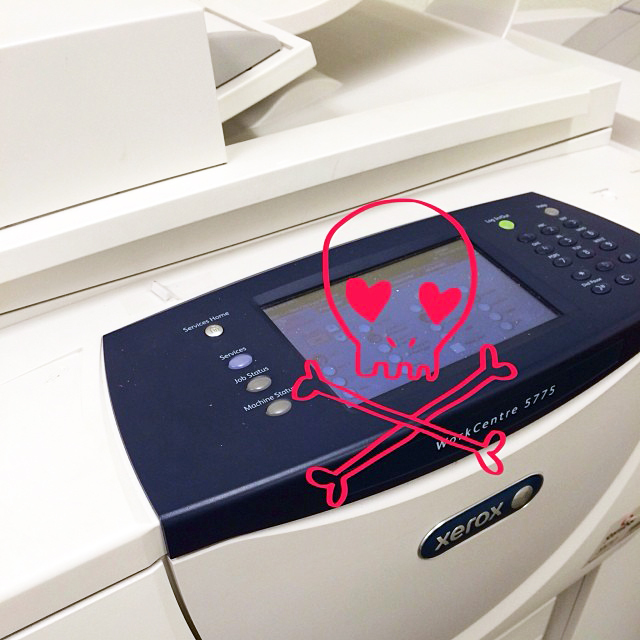 I also loved not having to worry about being able to make copies last minute any more by planning ahead. It is definitely something I am going to keep up with. 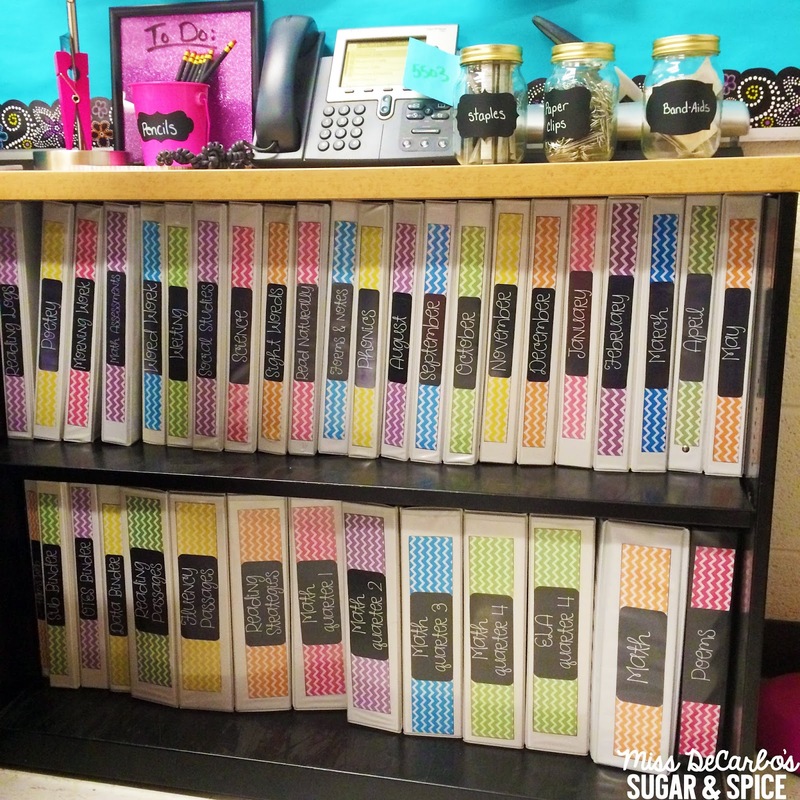 I love the binder idea!! I will definitely try that next year. I only wish our lesson plans were as simple and short as yours. 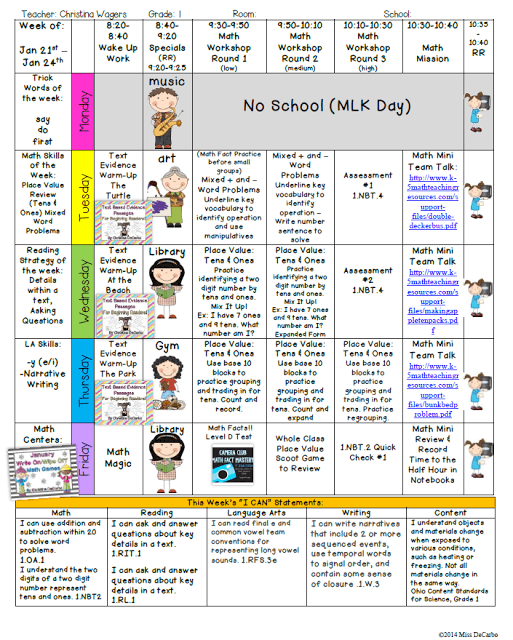 I teach 2nd Grade (self-contained) and our District requires long and detailed lesson plans, with the "I do, yo do, we do" format for every single day, along with the Standards and students objectives for every activity, which I think is a waste of time. Our lesson plans are 8 to 10 pages long….who has time to read all that?? Thank you so much for your post. I am definitely studying your tips and tricks for next year. I have one question that may have already been answered. What is "headsprout" mean in your guided reading plans? Love your post! Like Susy, I have to have detailed plans and they take me some time. I do love your desk with all of the labels on your cups!!! I love how your binders look all organized. I'm doing that this summer, but I have the problem with finding a shelf that the binders fit on. The shelves aren't tall enough for the binders to fit. Where did you get your shelf? This is great! I love your ideas on how to incorporate the students into helping. They love to have these kinds of jobs, and it helps us out tremendously. 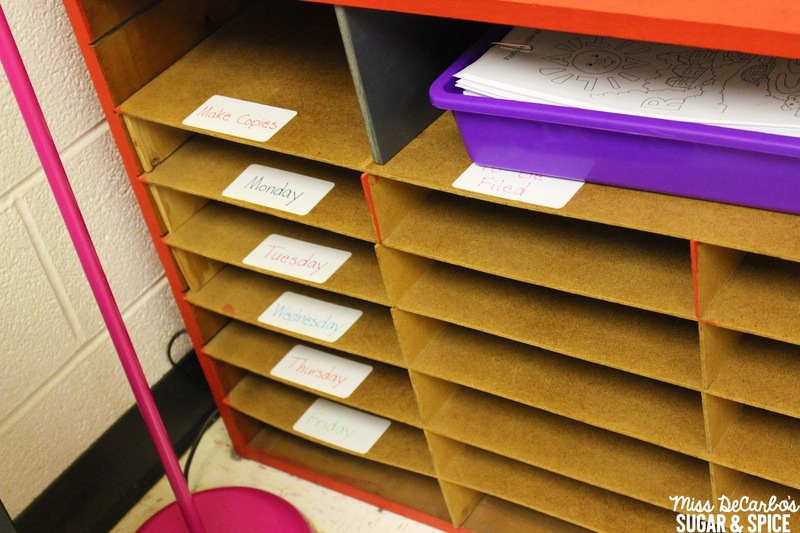 Love the idea of using binders instead of storing materials in file folders! Thanks for sharing! I'm a high school teacher, but I know how I can tweek your system to work for me! This all looks awesome! What program do you use to create your lesson plans? Nicely done. I teach high school and I totally agree that students should keep the room neat. I'm not OCD, but I placed a square of painters tape (in a color that matches my room) under the front left leg of every desk. 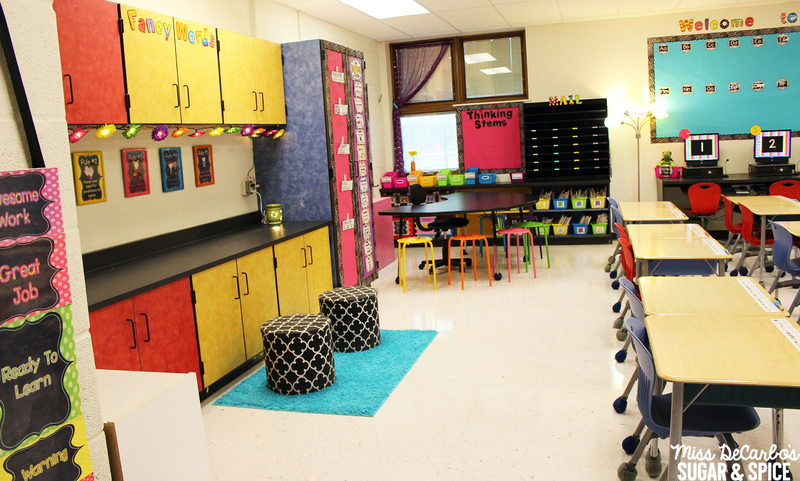 Students can clearly see where their desk should be and they automatically realign their desks. Its not much, but it saves me 5- 10 minutes every week of making sure the desks don't all crowd to the right of the room. Every little bit helps. Is there a trick you use to keep your binders from falling over? I have a lot of binders, and when I take one off the shelf to copy from it, they all slide over/fall off the shelf. great post. So many helpful post. I love the way you have your lesson plans set up. 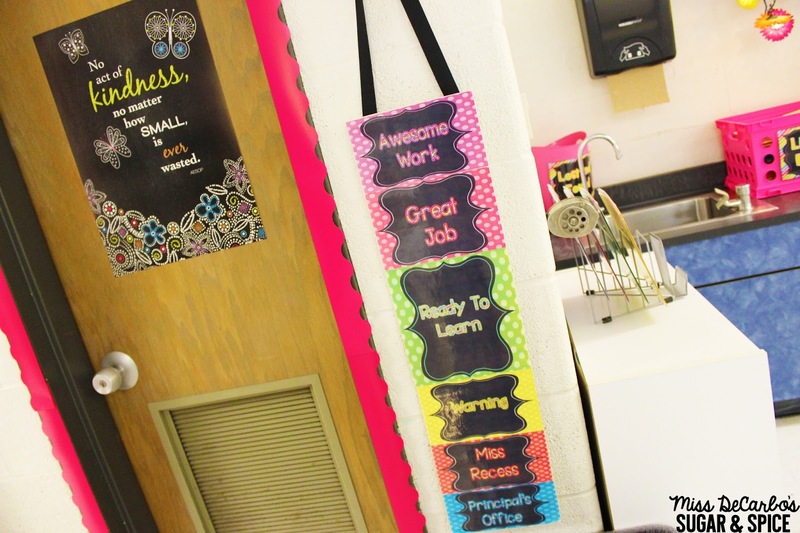 you should post a lesson plan template in your tpt store. I'd totally buy one. Keep up the great work! What font did you use on the binder spines?? I love it! I really like your lesson plan layout. Is there any way you can share an editable or blank document of that? I really like things planned out like that. Hi! I love how you have your notebooks for units organized. 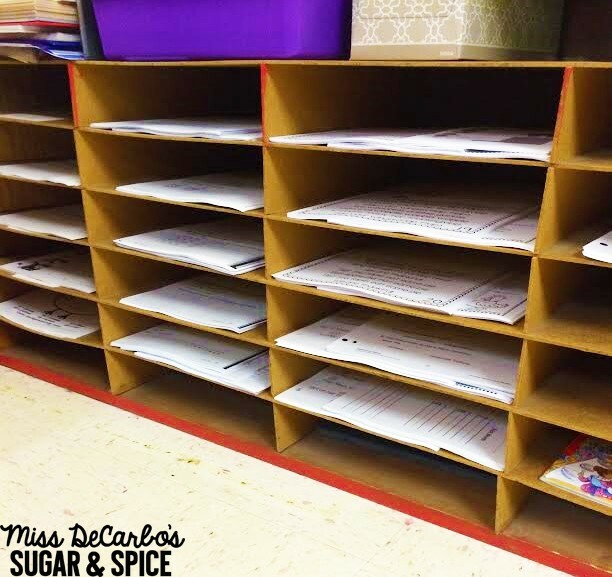 I am getting ready to start my 3rd year teaching & I'd love to learn how you went about organizing those unit binders (what you included etc). Thanks for the tips! I am in love with some of your decorations. 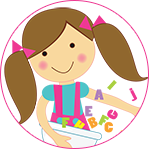 Where did you find your pink buckets and blue square ones? Hi! So I am thinking about switching to binders for my organization. My question is how do you decide if something goes in the month’s binder or in the subject? For example, lets say I have a math project with a St Patty’s Day theme. Do I put that in the math or the March binder? Thanks! Great post! I really enjoyed reading your tips! The wooden organizer is a great idea to organize all those papers we need daily. My desk looks a hot mess most times because of that. I intend to invest in one to help with the paper heap! Thank you for sharing your ideas along with the amazing pictures! Excellent ideas for organization! I too have a checklist for my weekly responsibilities, but instead of pritining off multiple copies of it, I inserted it into a page protector. I then use a wet erase marker to check off items. At the end of the week I wipe off with a dampened tissue or Clorox wipe. I love that idea, Melanie! 🙂 Thank you so much for sharing! And I completely agree that students of all ages can be trained to get their own papers and even turn them in a designated location. I’ve taught 2nd, 4th, and 5th grades and I had to learn the hard way that I don’t need to sharpen every pencil or put their morning work on every desk. #IAmFree! I’ve pinned this on my Operation Organization board. Great stuff! If you collect a template from A Teacher’s Plan, is the template editable? I do not yet know my schedule for the coming year. Also, where did you find your clip art images for the children in your plans (adorable)? I read blogs to get ideas often but I NEVER comment. I really enjoyed your organization post ideas! I’m going to try to implement everything you said in this post with my own twist! Thank you So much! You are Fabulous!!!! Thank you so much! I’m thrilled you found it helpful. Thanks for your kind words! This is the first time I have ever read anything on your blog. I just Graduated and finished student teaching will be subbing soon. The whole time I was reading I thought wow this sounds like where I am from. Then I read your about page. I was right you are from Northeast Ohio just like I am. I have subscribed to your blog. I look forward to teaching, planning and juggling everything. Thank you for your tips and tricks. Were you able to purchase your binders somewhere for cheap since you have so many? Good binders are so expensive! Love your organization and classroom! 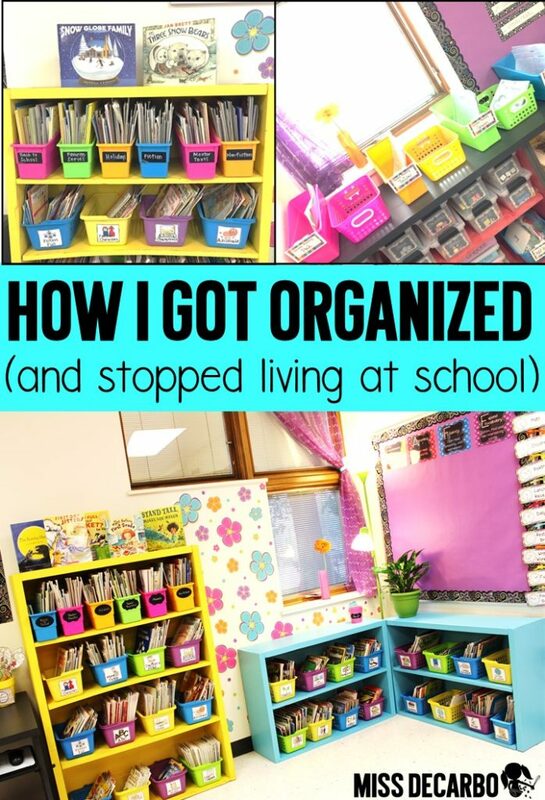 Wow, you really have taken organization to the next level! It’s great that you have a plan. Going back into the classroom after having been an administrator opened my eyes to how many teachers struggle with organization. I walked into too many classrooms that looked like a tornado. Those teachers could’ve definitely used this post. Thanks for sharing. Thank you so much for this lovely post! I am currently a student in Calfornia who is completely lost and in awe of your giftedness to be so organized and just so passionate about what you do. Thank you for giving me direction and inspiration as I learn to implement some of these awesome things into my future class one day. What size is your organization table (cubbies)? How many rows does is have? From the picture, I can see that it has 6 rows but not sure how many columns it has. This organizational section really makes planning easier for the week.